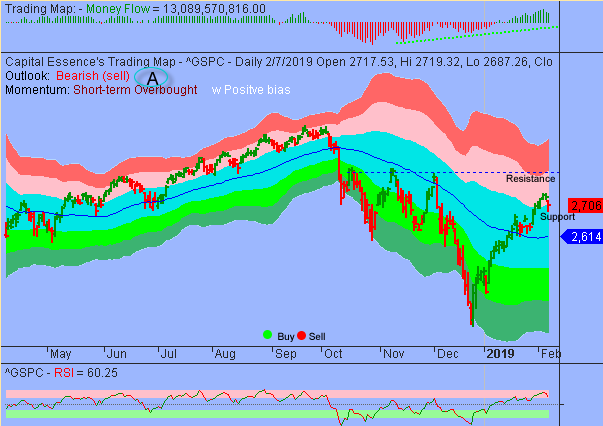 Good Morning, this is Capital Essence’s Market Outlook (the technical analysis of financial markets) for Friday February 8, 2019. We’ve noted in the previous Market Outlook that: “several key technical indicators suggest that S&P is in a midst of a short-term consolidation phase.” As anticipated, stocks closed lower Thursday as recurring concerns about prospects of a U.S.-China trade deal fueled broad-based profit taking. For the day, the S&P lost 0.9 percent. The Dow Jones Industrial Average gave up 0.9 percent, the Nasdaq Composite fell 1.2% percent. The CBOE Volatility Index (VIX), widely considered the best gauge of fear in the market, jumped more than 6 percent to 16.37. Recurring concerns about a slowdown in global growth triggered a flight to safety. Defensive sectors, utilities and real estate were the lone groups to finish with gains. As such, the Utilities Select Sector SPDR ETF (XLU) jumped 1.32 percent on the day and is up nearly 5 percent YTD, slightly underperformed the S&P. Now the question is whether the rally has more legs? Below is an update look at a trade in XLU. Our “U.S. Market Trading Map” painted XLU bars in green (buy) – see area ‘A’ in the chart. The dominant feature on the chart is the bullish pattern of higher highs and higher lows going back to 2015. 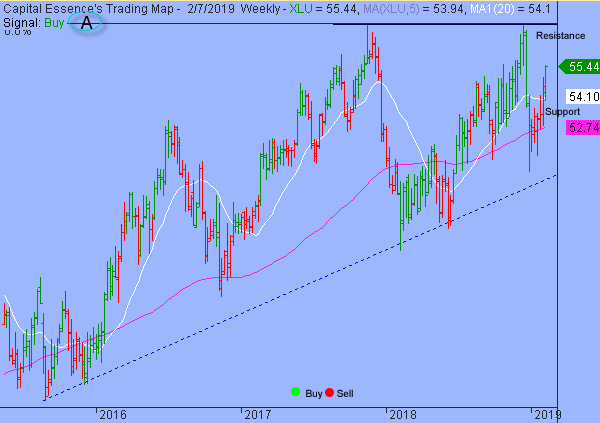 Over the past few weeks, XLU has been trending higher after the late 2018 selloff found support near the 2015 rising trend line. This week’s rally pushed the ETF above the 20-week moving average, a key technical level based on moving averages. This is a positive development, opened up for a test of the more important resistance near the 57 zone, or the 2018 highs. XLU has support near 54. Short-term traders could use that level as the logical level to measure risk against. Short-term technical outlook shifted to bearish (sell). Last changed February 7, 2019 from bullish (buy) (see area ‘A’ in the chart). As expected, the S&P moved down to test support at the important sentiment 2700 mark after the late January rally attempt ran out of steam near the 2740 zone. In accordance to the Japanese candlestick pattern recognition, Thursday’s bullish long tail is a clear indication of demand overwhelming supply. This bullish development but let’s notice that momentum indicator is much closer to overbought than oversold zone. So it should not be surprising to see further backings and fillings in the coming days. For now, 2700 represents a major price support. Expect the index to draw in buyers in any pullback to that level. Meanwhile, a close below it signals a short-term trend reversal and a test of the trend channel moving average, currently at 2614, should follow shortly. Short-term trading range: 2660 to 2740. S&P has psychological support at 2700 while key support is at 2685. A close below 2685 has measured move to 2660. The index has resistance near 2740. A sustain advance above that level has measured move to 2800. In summary, our near-term work on momentum and price structure suggested that market is in a process of establishing a near-term support plateau. S&P’s 2700 is the line in the sand. All bets are off should the bulls fail to secure this support.